Like their close cousin, black tea, both white tea and green tea come from the leaves of the Camellia sinensis plant. The colors of the leaves reflect the amount of wilting and oxidation they have undergone. Both white and green teas contain copious amounts of polyphenols -- antioxidant plant compounds with proven health benefits. More scientific research has been done on green tea than white, but one preliminary study suggests that white tea may have an edge in terms of cancer protection. Green tea is produced from leaves that have not withered or oxidized, while white tea comes from young leaves and buds. White tea is the least processed of all teas, and has a sweeter, milder flavor than green. The National Cancer Institute reports that both white and green teas contain about the same amount of catechins, a specific type of polyphenol. These natural plant compounds appear to have numerous benefits for health. The University of Maryland Medical Center reports that green tea may help stop the growth of cancer cells in many varieties of the disease, including breast, esophageal, prostate and stomach. 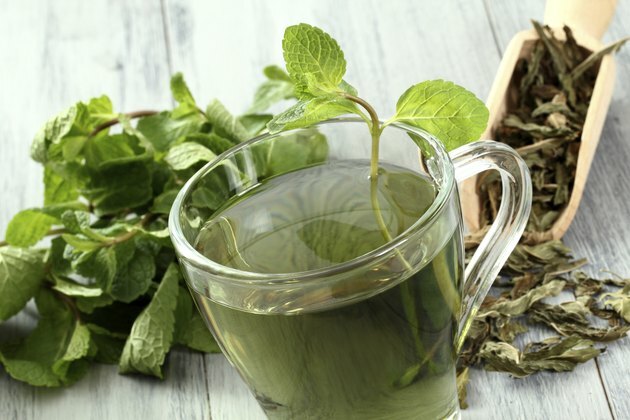 UMMC notes that green tea has also shown positive results in preventing atherosclerosis and high cholesterol, both of which can lead to heart disease. It also may promote thermogenesis, a fat-burning process that contributes to successful weight loss. A report published in the “Journal of Indian Society of Periodontology” in 2012 found that green tea may even promote good dental health by reducing inflammation and bacteria associated with gum disease. When it comes to cancer prevention, white tea may have an advantage over green. Researchers at the Linus Pauling Institute in 2000 tested four kinds of white tea on rats to assess their benefits for colon cancer protection. Because of white tea’s higher content of some polyphenols, the scientists found it was better than green at mitigating harm done to DNA -- a type of cell damage that can be a precursor to cancer. However, the researchers cautioned that additional studies would be needed to confirm the same benefits in humans. Both green tea and white tea have less caffeine than black tea or coffee. White tea contains the least, with 30 to 55 milligrams per cup, compared to 35 to 70 for green tea. A study published in “Molecular Nutrition and Food Research” in 2007 found that adding lemon or soy or rice milk to green tea significantly boosted the body’s absorption of its antioxidants. The National Cancer Institute advises that hot brewed tea has greater concentrations of polyphenols than iced or bottled varieties. Talk to your doctor before adding green or white tea to your diet because they may interfere with some medications. Linus Pauling Institute: Is White Tea Better Than Other Teas as a Potential Anticarcinogen? Choice Organic Teas: How Much Caffeine Is in Tea?